It's summer, which means it's time to start sewing for CHRISTMAS! I celebrated my birthday yesterday, spent the day sewing and hanging out with family. All day long I kept thinking "I want to give away a free pattern for my birthday!". Unfortunately I never got around to it (where does the time go!). SO today I am happy to blog a free Christmas pattern! Why Christmas? Because I LOVE Christmas and I LOVED making this super cute Christmas quilt. This is a SUPER easy pattern and great for beginners! Step 2- Begin the other tedious process of cutting out all the triangles! The easiest way to do this is to cut off a strip of fabric that is 6 1/2 inches wide. Flip the ruler over and cut out your second triangle. This should waste the least amount of fabric possible. Oh don't forget to cut out all the white triangles too!!! Yeah, cutting is SO much FUN! Step 3- Jump for joy because you completed steps 1 and 2. Then begin the tedious process of sewing all your squares together. This is how you will sew your triangles together. You will have one triangle with a point, and one with out. See picture below because that was a HORRIBLE way to describe that. Still confused? I know I am, so here is another picture with the triangles lined up and ready to sew! Don't forget, you're sewing them RIGHT SIDES TOGETHER! 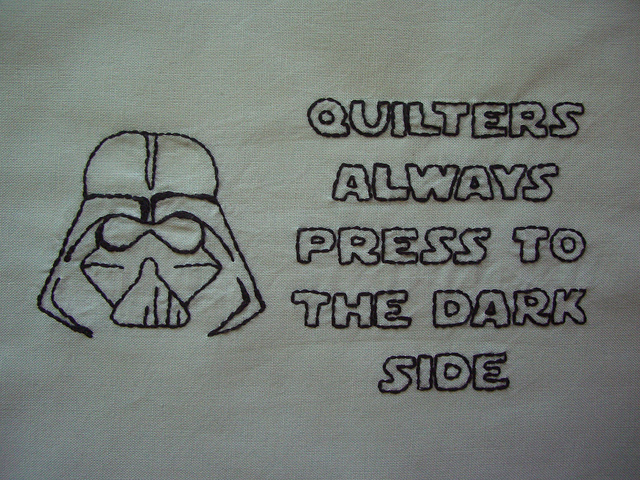 Remember to press your seams to set the seam, then open your triangles and press the seam to the dark side. Always remember the wise words of Darth Vader! Fun disclaimer- I did not sew these triangles together, my mom did them all!!! After your mom sews your triangles together (or after you sew them) you will end up with a big pile of Christmas squares.See what happened there, the triangles became squares!
. They look so pretty and festive! Step 4- Lay out your quilt, and cut out the white panel (if using). Step 5- Take a break and admire how festive your quilt is! I love the traditional colors. Step 6- Get back to work and make your trees. I wanted my trees to be triangles since I was making a triangle quilt, but I think any trees would look cute. Or maybe some presents, or a Santa, or whatever you fancy. Third, I cut my trees out using my templates. Fourth, I stole some fusible interfacing from my mom and cut it along with batting out, the size of my trees. After you have everything ready,place the interfacing on the wrong side of your tree and iron (DO NOT let the interfacing get on your iron, read all the instructions prior to using). This is double sided interfacing. You will iron down the side with out paper, keep the paper on for now. Make sure you iron on the WRONG side of your fabric. Use some scraps to make tree stumps. Place trees where you want them on your white square. Stitch around trees and trunks. Step 7- Now that you have all your squares and tree block you can sew your quilt together!!! Step 8- Add a 2 1/2 inch border around the entire quilt. I love this feature on my new sewing machine! This pattern is pretty self explanatory, but I made a quick reference for the those of us who like a visual. Please note that this says the finished quilt will be 54x60 that is BEFORE you add the 2 1/2 inch border all around. p.s. you may have noticed that this quilt has yet to be quilted and bound! I am vacillating between quilting it on my machine, or long arm quilting it.... Once it's complete I will upload the finished pictures. I can't decide if I enjoy making Christmas quilts, or Halloween quilts more! Which is your favorite holiday to sew for? Stayed tuned for my Haunting Hexie Halloween quilt! Thanks so much for this cute Christmas pattern! it's going on my to-do list (maybe for next year!) Happy Belated Birthday!! Good luck! It comes together fairly quickly, I'd love to see the finished quilt! And thank you! You've got 12 months! You can do it! It's so easy and fun! Good luck!